Natural catastrophes seem to be coming more often than ever in recent world history. In the last ten years, Hurricane Katrina turned lives upside down in New Orleans, an earthquake essentially destroyed Haiti and took over 300,000 lives, Indonesia saw nearly a quarter of a million die as a result of a devastating tsunami, a cyclone took just under 150,000 lives in Myanmar in 2008, and now an earthquake has hit Japan. As a result of the earthquake, a tsunami broke out as well. The earthquake was bad enough as it registered as 8.9. 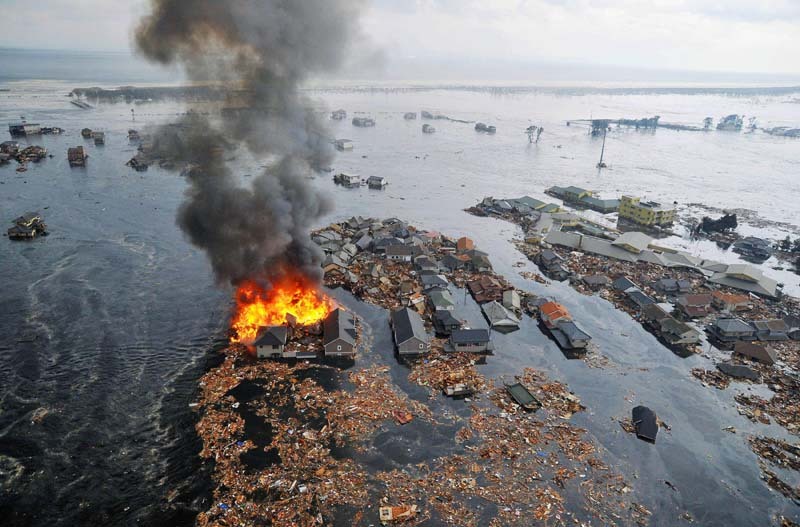 Even worse, with Japan being an island, the waters surrounding it were sent into a frenzy and as the aftershocks were settling, the water was rising up onto the mainland. At least a few hundred of people have already been confirmed dead from the disaster. Waves of over thirty feet in height came across the land and left cities underwater and uprooted homes and vehicles. In addition, other buildings crashed down due to the quake and others were lit up in flames. The tsunami was being felt all the way to the United States. Hawaii reported seven-foot high waves coming across the islands. Now the rescue effort is underway. As soon as the sun rose in Japan Friday morning, rescue workers began to search for survivors. Six million homes in Japan are now without electrical power. Many people do not even have their homes anymore. President Barack Obama and the government of the United States quickly began to organize relief efforts. Almost instantly, Obama sent support over to Japan. Officially the fifth largest earthquake in recorded history, for the first time in a long time, an entire country that happens to be a world power is in trouble. But the faith in Japan to come back from this tragic event is high. It was not that long ago that two atomic bombs were dropped on Hiroshima and Nagasaki to end World War II. After the crushing blow, Japan regrouped and regained its world power status by succeeding economically. As the water begins to settle and the relief effort is underway, it is no doubt that things are not going to get better overnight. With New Orleans still recovering from Hurricane Katrina, it is likely that Japan is going to be feeling the effects of this catastrophe for years. But with their powerful economy and track record of bouncing back, it is clear that Japan is going to recover in due time.